DAYTONA BEACH, Fla. (June 14, 2018) – Even a forecast of 100% chance of rain didn’t stop the loyal Freemansburg race fans from lining up hours in advance to get prime seats for Round 2 of the AMA Pro Hillcimb Series. The 450 Class got started with returning champion and last week’s 450 winner Jay Sallstrom (#2, above). Jay had the perfect opportunity to take the fast time of the day with the first draw in the running order and the anticipation of rain destroying the hill throughout the day. That opportunity, however, was washed away as Sallstrom’s 450 was ripped out of his hands at the 475-foot mark, leaving a chance for the win to the next 13 riders. The hill would prove to be just as difficult for most of them. Bryan Rusnak was the first to make it over the top with a 18.103, but that was soon was overcome by the veteran Phil Libhart, who posted a 15.821. After Vinny Nuzzolilli, Molly Carbon, Justin Hampton and Justin Fowler settling with distance runs, it would be self-sponsored Jason Kostan finding himself in the lead with a time of 14.583. That lead would be short lived with John Flyin’ Koester immediately following Kostan and setting the fast time of the day—a 14.061. As we moved into the 2nd round it appeared as if the hill was getting faster as more bikes were turning in faster times. Koester’s time still seemed unbeatable until Moto-Tech Trailers’ rider ‘Wild Man’ Jack Mason left the line. With a flawless run, Jack cleared the lights at the top of the hill, leaving the impression that it was definitely a contending run for the podium. As the clocked stopped at 14.963, both Kostan and Koester were safe, but Libhart was knocked off the podium. With the win already in hand, Koester took his second run, giving the rain-soaked race fans an exciting finish. With no one to beat but himself, Koester finished the round with a time of 12.860, bettering his first run by over a second! Expectations were high for Deryk Beaudoin in the Xtreme class, returning this weekend after an impressive podium finish in Round 1. Deryk would start the runs with a time of 11.270 and was immediately trumped by Sallstrom’s time of 10.973. Jay’s time would hold through the entire first round, albiet with several riders challenging the top times. Justin Fowler was one, turning in a time of 14.155 on one of the few two-stroke machines still left in the class. 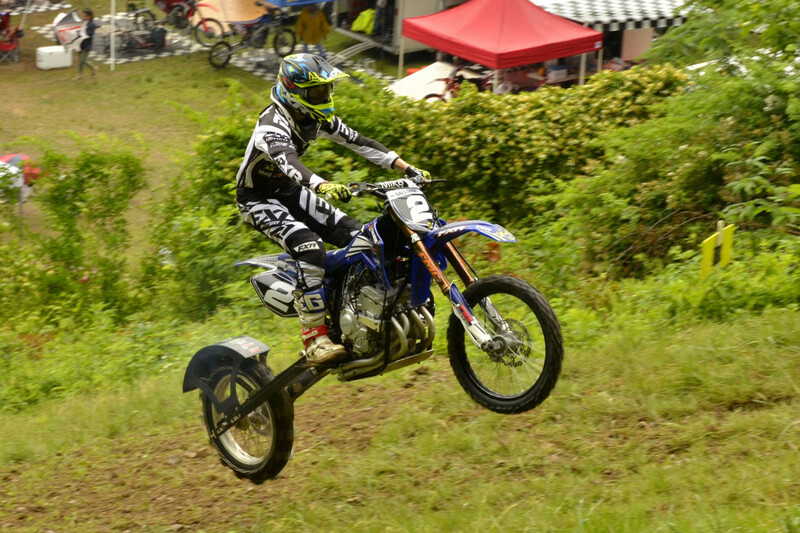 Nick Briggs seems to be honing his bike’s performance in this season with his standout ride in the first round. Vinny Nuzzolilli, coming off the win at White Rose, showed consistency this weekend with his time of 11.796 to land him the number three spot in the first round. In round two, returning AMA National Champion John Koester stayed focused after a potential fuel issue caused his bike to underperform, finishing off pace with a 14.775. Unfortunately, round 2 would continue without Deryk Beaudoin due to a mechanical issue with his engine. Nuzzolilli and Koester’s second attempts would leave the crowd in awe after two spectacular crashes. The top runs in round 2 were the 1973 Triumph of Phil Libhart, only seven tenths of a second off of a podium finish, while Briggs returned in round two to better his time to finish the day fourth overall. This left Jay Sallstrom one-and-done for the day, Beaudoin with back-to-back 2nd-place podium finishes and Vinny Nuzzolilli in third but still leading the Championship. The first round of the Unlimited Class set the stage for what would became a nail-biting finish at the end of the day. You couldn’t have written a better story as things started off with Vinny Nuzzolilli, returning after the win the previous weekend. With an incredible run on the nitro-injected CBR, ’Nuzz had potentially locked in back-to-back wins with a time of 10.143. Jay Sallstrom, not willing to give the win to Vinny, left nothing behind with his run of 10.576. Koester, also trying to play catch up from the week before, came out wanting to win it in the first round. His run of 10.633 looked smooth and fast and didn’t really appear to have much room left to clean up. Second-round action started with ’Nuzz passing on his attempt until someone beat his time. Although times were better in the second round (despite the all-day drizzle), Vinny’s time of 10.143 held up. And then came Koester… and boy did he fly! His run was scary fast and stopped the clock at 10.002. That meant Vinny would have to suit up to try to regain fast time! Everyone knew he would have to push the edge to beat JK’s time, and every pair of eyes at the Bushkill Valley Motorcycle Club was on the hill and on the clock. Vinny left the hole “in it to win it,” but when he bobbled at the 2nd jump he knew he wouldn’t beat Koester’s time – so he pulled off, making the smart decision to stay safe and settle for 2nd. The round ended with Koester on top, Nuzzolilli second and Sallstrom third. There’s just a few days before the AMA Pro Series heads to Laconia Bike Week for its Wednesday race. The points chase for the Championship is on!